Physicsgamesayswhat? No, really, who doesn’t love a good block builder? 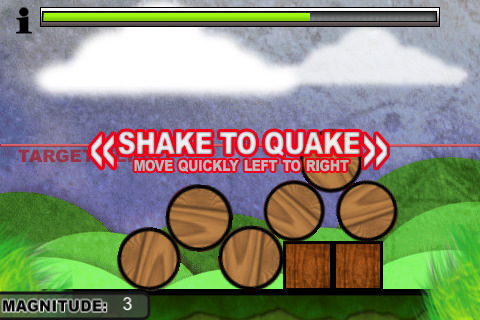 Quake Builder is the kind of game that simultaneously speaks to our primitive desire to build and destroy. You are called upon to construct towers out of simple shapes that are sturdy enough to withstand a mighty earth shaking. Some of your towers may not survive, but the unspoken motto of the game seems to be: If at first you don’t succeed, try, try again. Blocks fall from the sky and you must build a tower out of them up to the required height, and like any good contractor, you’re racing against the clock. Once everything is set into place, shake the iPhone to start the quake. If you’re lucky, your tower will manage to hold it together for the 10 seconds necessary to end the level. If you’re not so lucky, you pick up the pieces and try again. Occasionally levels will have hints, but I confess, I found most of these so cryptic as to be useless. I loved playing with blocks as a kid, so the game had a lot of initial appeal for me, thanks to a very clean and basic design scheme. The physics engine took a little more getting used to, as blocks will bounce and move in unexpected ways during construction. Also, if you accidentally knock them off the platform, they’ll return by falling from the sky, potentially destroying any half-finished work below. Some of the pieces also require a bit of rotation, which gets complicated thanks to wildly unpredictable touch controls. In general, moving the blocks around isn’t an issue, but I came to dread the long blocks because the rotation controls were so awkward. Even the exploding blocks didn’t irritate me half so much as the ones that needed rotation. What bothered me more about the game was the fact that almost none of my towers ever felt truly stable. Once the rocking and rolling started, there was never a sense of a job well done, just constantly panicked feelings of “Oh, please, oh please, just last two more seconds!” In fact, it was usually the case that my tower would collapse into rubble during the “SUCCESS! Your building survived!” screen, which made each victory too bittersweet to be genuinely enjoyable. Once you complete all 20 levels, the game sharply veers into Angry Birds territory. You can play all levels over, only this time with birds attempting to dive bomb your efforts, and you must squash them before they knock anything out of place. It looked and felt like a cheesy add-on trying to capitalize on a more popular game, and I wasn’t a huge fan, especially since the game icon makes it look as though the birds play a bigger part. The birds add a bit of added challenge and replay value, but they feel rather out of place, and if you like block building physics games, the rest of Quake Builder is a perfectly reasonable and cheap option. Although the control scheme and the physics engine need a bit of tweaking, the premise is sound, and you’ll likely get your money’s worth from this little game. AppSafari review of Quake Builder was written by Tracy Yonemoto on May 12th, 2010 and categorized under App Store, Games, Physics Based. Page viewed 3356 times, 2 so far today. Need help on using these apps? Please read the Help Page.